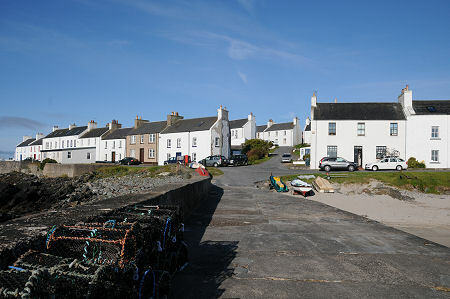 The settlement of Port Charlotte enjoys an idyllic location on the north western shore of Loch Indaal. The views are superb and extend to the Mull of Oa in south west Islay and the American Monument on the cliffs at its western tip, 10 miles to the south. Looking north across Loch Indaal reveals the hills of eastern Islay and the distant Paps of Jura. This supremely attractive village dates back to 1828 when it was established by Walter Frederick Campbell, the Laird of Islay. It was developed primarily to provide housing for the workers in the large Lochindaal Distillery, then being built on the shore here. When whisky writer Alfred Barnard visited during his tour of Islay's distilleries in 1886 he found "a village of little importance and interest except for the large distillery." Lochindaal Distillery closed in 1929, but the local distillery tradition continues a little along the coast at Bruichladdich Distillery. In an interesting reversal of fortunes the owners of Bruichladdich have in recent years purchased some of the premises originally forming part of the Lochindaal Distillery, and have announced plans to establish and open what will be known as Port Charlotte Distillery in the village. When it came to naming villages, Walter Frederick Campbell of Islay was a man who never strayed far from home for inspiration. When he established a village at the south end of Islay in 1821, he named it Port Ellen after his first wife Eleanor. Port Charlotte was named after his mother when it was founded in 1828. And when he founded a fishing village at the tip of the Rhinns of Islay in 1832, he named it Wemysshaven (later Port Wemyss) in honour of his father in law, the 8th Earl of Wemyss. Today's visitor to Port Charlotte finds a beautiful white-painted village and the largest settlement on the Rhinns of Islay. 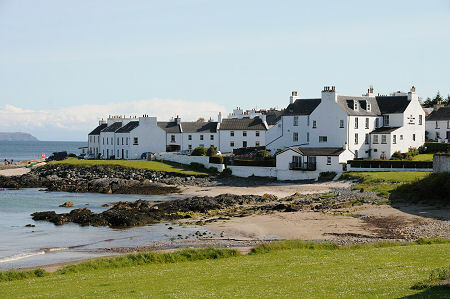 At the heart of the village is the large Port Charlotte Hotel, fronting onto the Main Street and backing onto the beach. Stretching south west from the hotel is the central portion of Port Charlotte's Main Street. The land here slopes down towards Loch Indaal and this part of the street is designed on a split level. Houses on one side are raised above the road, while those on the shore side are set below it, together with their tiny gardens. Much of the village seems to have been caught at a particular moment in time and it repays exploration. Some of its features, like small back closes and yards reached through archways in terraces of houses, seem to reflect the design of big city life in the 1800s rather than the layout of a small island village. The overall effect is unusual and very striking: and adds considerably to the interest and attraction of Port Charlotte. Meanwhile the village also offers a stone pier extending out into Loch Indaal, and a fascinating shoreline that alternates between sandy beaches and rocky intrusions. Although Lochindaal Distillery ceased production in 1929 some of its buildings are still in use. An old warehouse backing onto the sea is now used partly as the Natural History Visitor Centre. The upper floor of the old warehouse is home to the Port Charlotte Youth Hostel. Nearby is the old church converted into the excellent Museum of Islay Life. Both the Natural History Visitor Centre and the Museum of Islay Life are well worth visiting. The original village school, in the upper part of the village, has been renamed Port Charlotte Hall and divided into self catering lets. A little further afield, the slight rocky headland to the north of Port Charlotte is home to the Loch Indaal (or Rubh' an Dùin) Lighthouse. Half a mile further north is St Kiaran's Church. Meanwhile, one of Islay's very few camping and caravan sites is just to the south west of the village at the Port Mor Centre and Campsite.